"DreamWorks Pictures has revealed the poster for their upcoming thriller The Fifth Estate, from director Bill Condon (Gods and Monsters) starring Benedict Cumberbatch, Daniel Bruhl, Anthony Mackie, David Thewlis, Stanley Tucci and Laura Linney. "SYNOPSIS: Triggering our age of high-stakes secrecy, explosive news leaks and the trafficking of classified information, WikiLeaks forever changed the game. 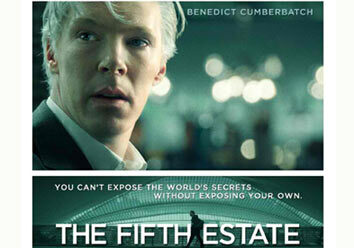 Now, in a dramatic thriller based on real events, The Fifth Estate reveals the quest to expose the deceptions and corruptions of power that turned an Internet upstart into the 21st century's most fiercely debated organization. "The story begins as WikiLeaks founder Julian Assange (Cumberbatch) and his colleague Daniel Domscheit-Berg (Bruhl) team up to become underground watchdogs of the privileged and powerful. On a shoestring, they create a platform that allows whistleblowers to anonymously leak covert data, shining a light on the dark recesses of government secrets and corporate crimes. Soon, they are breaking more hard news than the world's most legendary media organizations combined. But when Assange and Berg gain access to the biggest trove of confidential intelligence documents in U.S. history, they battle each other and a defining question of our time: what are the costs of keeping secrets in a free society—and what are the costs of exposing them? “The Fifth Estate is presented by DreamWorks Pictures and Reliance Entertainment in association with Participant Media and is produced by Steve Golin and Michael Sugar, with Bill Condon directing. The screenplay is by Josh Singer, based on the book Inside WikiLeaks by Daniel Domscheit-Berg and the Guardian book WikiLeaks by David Leigh and Luke Harding. The film will be released in U.S. theaters on October 18, 2013, with international dates to follow (including the Philippines)." Ed's Note: When content falls under "Press Statement," this means that the material is fully and directly from the company issuing the press release. The use of open-and-close quotation marks to envelope the entire text shows as much. This also means that PEP is not the author of the statement being read. PEP is simply providing the information for readers who may be interested.